We are one of the well renown manufacturers and suppliers of Centrifugal pumps. 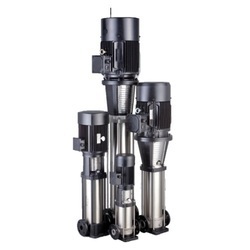 Our pumps are highly in demands from water based industry due to its efficiency and quality. These pumps runs on fan cooled A.C induction motor which make perfect to continuous use. Motor stator of these pumps are assembled under rigid pressure and locked frame and made of low watt loss steel lamination. Our pumps are engineered using dynamically balanced rotor to ensure noise and vibration free operations.